I grew up up in a small neighborhood, surrounded by farms, in a suburb of Philadelphia. It was a magical place, actually. Many days were spent playing outdoors in the neighboring fields and at the quarry that was in our ‘back yard.’ This serpentine rock quarry was converted to a private swim club decades ago, and is one of the oldest swim clubs in the United States. I spent much of my youth in the water, on the man made beach, or playing sports in one of the yards in our neighborhood. We were close neighbors, with several parties and special events each year. The children were able to play freely, late into the the night, and even spent many nights on the land. We had forts, trails, secret places, and even a “bat cave” in the field behind our house. We played many different games: army, cowboys and Indians, spin the bottle, tag football, pond hockey, wiffle ball, softball, flashlight tag, capture the flag, kick the can, and more. In the quarry pool was a very old telephone pole (we called it the “log”), on which we all learned to stand and roll. I actually held the record for standing on the log the longest, at somewhere just 3 hours. My record has since been broken by the son of one of my childhood friends, but my name and note of the record remains inscribed on the wall of the old lifeguard room. There is tremendous heritage and history at The Quarry, as it was mined for serpentine stone, which was used to build homes in the 1700 and 1800’s. Many serpentine buildings remain standing today, and include ones where Revolutionary War soldiers ate and slept during the war. The Quarry Swim Association – “The Log” is floating near top right of image (from Facebook Page). One of my favorite youth activities was participating in Indian Guides, which is similar to Boy Scouts. We would meet to participate in activities, to camp, and to learn about the native culture. Our tribe was the Lenape, in honor of the native culture that has lived for centuries in the Delaware River Valley. I feel there were a couple of reasons I enjoyed Indian Guides, one being I got to spend some precious time with my father, who worked long hours, and the other being because I had a heart connection to the culture. I don’t remember a lot of the movies I saw as a child, but one still remains etched in my heart, and that is a movie called “A Man Called Horse.” This movie is about a white man who was honored by being accepted into the native culture through intense ceremonies and journeys. I mean no disrespect to our native culture, but even as a child, I wanted to be accepted into the native culture like the man in this movie was. It is not until recent years do I now understand and believe that possibly in a previous life I was a Native American, and that I was being called as a child to connect with the beliefs and values of native culture. Somewhere along my journey, though, as I got older, I started to drift from this native and spiritual connection, and I started to walk the path that most men were expected to walk in our western culture. You know, make money, work lots of hours, and keep the American dream alive. While Indian Guides and hanging out at the Quarry provided me a sense of belonging, the truth is that I felt very alone as a child. I could point to a variety reasons for this, and I could describe different incidents when I was bullied, teased, and excluded by my peers. I can tell you I spent many afternoons alone in my room to study and then to fall asleep. I understand now that I was actually experiencing the world in a different way, and that I was deeply in touch with an emotional and spiritual part of me, and there was no one who helped me to understand and more fully connect with this spiritual deepness. It didn’t help matters that I was very quiet, and that I kept my deepest feelings and thoughts to myself. I do remember meeting with the pastor of our Lutheran church, and seeking guidance about how to become a minister, so there certainly was a part of me that was willing to explore my gifts of a healing and knowing spirit. It has taken years to understand, but my brain injury 15 years ago unearthed my childhood gifts and inquiry, and my desire to connect with our native culture. Understanding and navigating this cognitive injury, which stills reminds me each day that I must honor stillness and mindfulness, was helped by many different alternative medicine practitioners. 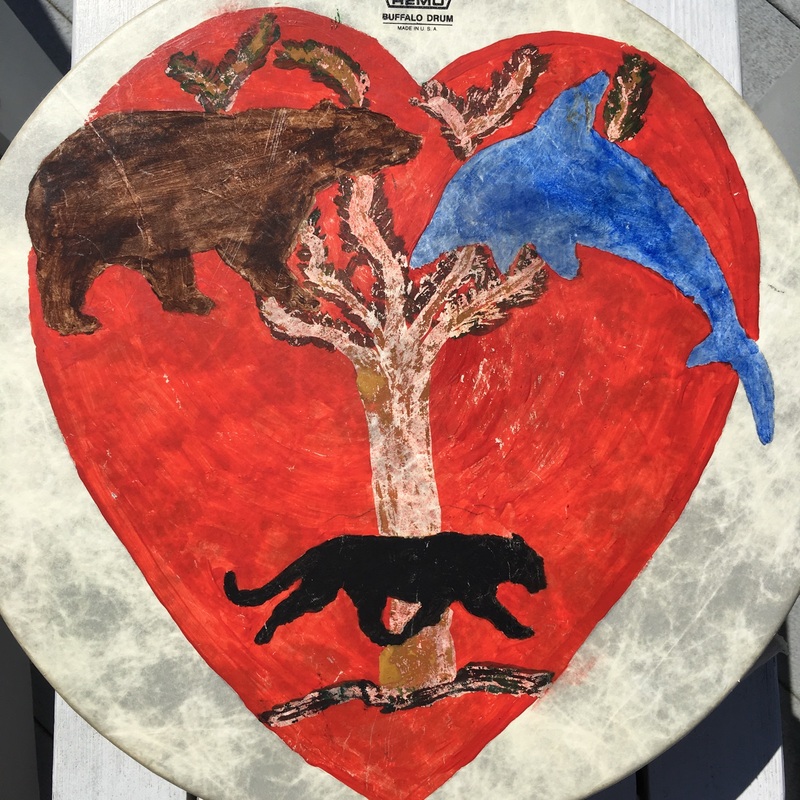 I was encouraged to seek the assistance of a shamanic practitioner, and so I met with two, and, together, they lovingly guided me on my first shamanic journey. I was captivated and I was relieved; finally, someone who ‘got me’ had introduced me to myself. I researched local shamanic trainers, and excitedly took on training as a shamanic practitioner myself. Now, I practice shamanic journeying on a daily basis, and there is no doubt this practice has brought the most clarity and acceptance into who I am. I am pretty sure the universe found a way to hit me over the head (literally) so that I would reawaken to my childhood passion and gifts. I am so grateful for the practice of shamanism and for what I will continue to learn. I am grateful for the universe helping me to remember who I have been all along.